Last month the Parks Department and Central Park Conservancy announced a $150 reconstruction plan for Lasker Rink in Central Park. Described by the AIA Guide to NYC as the park’s most “disastrous” improvement for a modernist design that clashes with the Victorian appearance of the park. Part of this ambitious reconstruction plan is the daylighting of a section of Montayne’s Rivulet that was covered by the pool in 1966. The rendering above looking north from Huddlestone Arch restores the view that Olmsted envisioned of the creek flowing into Harlem Meer. In the heart of Central Park is The Ramble, a 38-acre woodland where the park’s trimmed lawns give way to an Adirondack terrain of thick forest, boulders, and The Gill, an artificial brook that flows through The Ramble, emptying into The Lake. At its widest point, The Gill flows through Azalea Pond, the smallest named waterway in Central Park. The maze-like paths deep inside this section of Central Park serve as a sanctuary for birds, a refuge for illicit activities, but at its most basic, a place to forget that one is in the middle of Manhattan. The northernmost of Central Park’s lakes shares its name with the neighborhood to its immediate north. Harlem Meer occupies the former confluence of Montayne’s Rivulet and Harlem Creek, a point where these two freshwater streams widened into a brackish estuary on their way towards the East River. 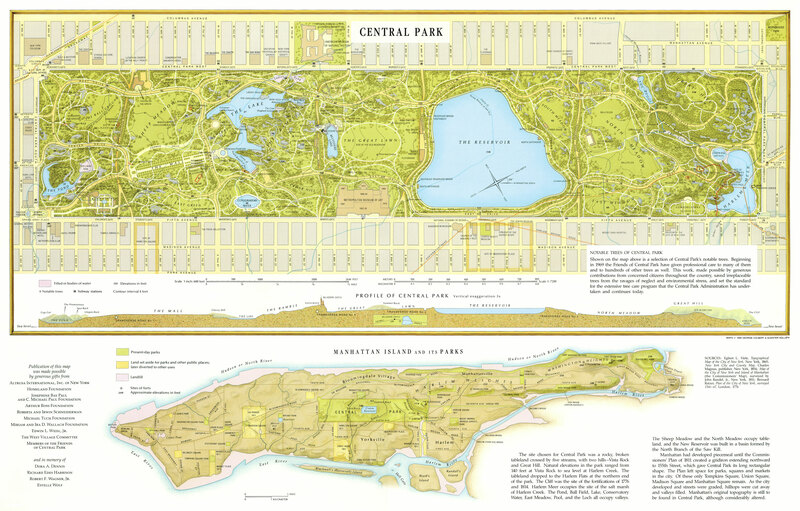 In the initial allocation of land for Central Park, the site of Harlem Meer would have been excluded from the park, its untouched terrain would likely have been buried beneath urban development. In 1863, the park was expanded north to 110th Street, encompassing the North Woods, a set of abandoned fortifications from the War of 1812 and the marsh where the creeks met. It has been a few months since I’ve had the Photo of the Week feature relating to the waterways of the city. With a little over a week left before the show ends, I stopped to see the photography exhibit My Father’s Son at the Arsenal parks headquarters in Central Park. The exhibit showcases works by Parks Commissioner Mitchell J. Silver, FAICP and his late father Irwin Silver. The father’s black and white works show life in 1950s New York, while the son’s photos show the natural beauty of the city’s parks. An experienced urban explorer knows that when an object appears unusual, it has a long history behind its appearance. One such example is the wall behind the 86th Street Shop in Central Park. This is where the Parks Department fuels and repairs its vehicles. The wall behind the shop’s parking lot is slightly inclined and runs straight between the shop building and the Central Park Precinct. This wall is a remnant of Central Park’s Lower Reservoir, which contained the city’s drinking water from 1842 to 1929. Following my recent post on The Loch in Central Park, park goer Steve Weintraub of the Blockhouse Run Club asked about a forgotten water feature at the park’s northern end that appears as a former stream on the 1994 Greensward Foundation map of Central Park. It was known as The Lily Pond, the smallest of Central Park’s original water features. Among the hidden waterways of Central Park, the one that most closely resembles its pre-park appearance is The Loch, a creek that flows from The Pool towards Harlem Meer in the park’s northwestern section. With so much excitement surrounding the lectures, tours and sales of the book, now is a good time to look back at the process behind its publication. When the Viele Map was selected as the cover image for my book, there were a couple of runner-ups. 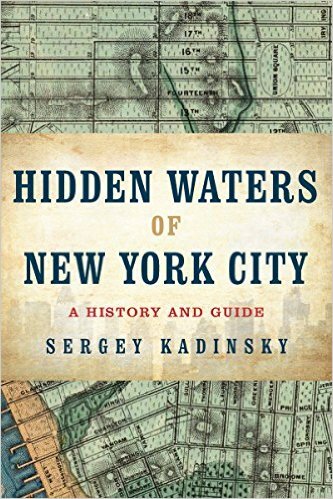 Here’s one image that depicts the subject of the book, a hidden waterway disappearing into a manhole. Nature and city together in one tight photo. Among the boathouses in New York City’s parks, the most famous is the one at The Lake in Central Park, where the public may rent a gondola or rowboat, eat a pricey meal, or hold a wedding ceremony. After a week of exclusive Queens coverage ahead of my King Manor Museum author talk, we return to Manhattan ahead of an important anniversary in Central Park.